A calendar is good, a calendar connected to Google, even better! RealOffice360™ gives you everything you need to build an extremely organized work calendar so let's get all of this synced with Google so you can see what you have to do on your phone and more. Go to your Calendar > Click on Sync to Google. *NOTE* - If you cannot toggle the Sync button, you will need to upgrade your plan first to Plus. Upon completing this process, you will see that the Calendar is "syncing with Google". 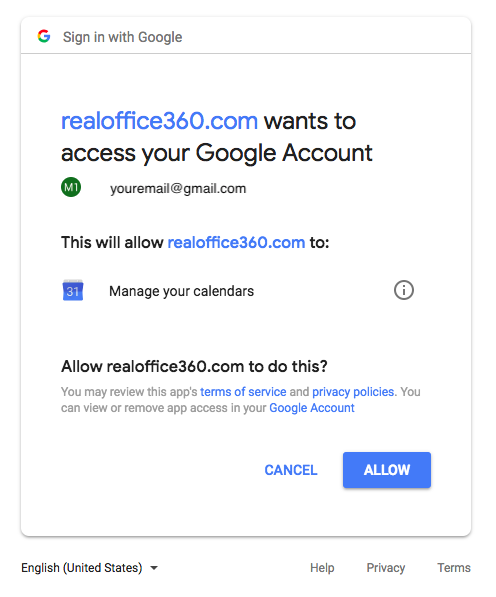 Once you have completed the Sync process, upon logging into your Google Account and going to Calendar, you will see the new "RealOffice360" calendar in your list of calendars. This calendar will show all events created in RealOffice360™. Need help? We are here for you so send us any question to support@realoffice360.com.